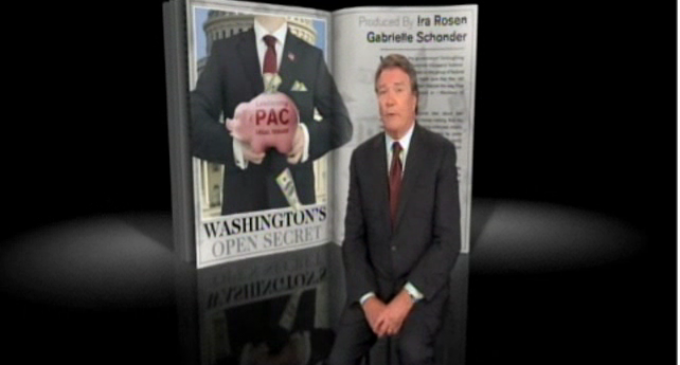 Most people think that congressman can’t use campaign funds for personal use, but as illustrated by this 60 Minutes report, politicians created a loophole around the law through leadership PACs, and use the money to live lavish lifestyles. Why is our president allowed to continually break the law, violate the Constitution and act like a dictator? Our congressman are bought and paid for. They are just as criminal. It’s time to clean house America! “It’s another example, unfortunately, where the rules that apply to the rest of us, don’t really apply to the members of Congress,” said Schweizer on 60 Minutes. The report, which contained selected material from Schweizer’s forthcoming book Extortion: How Politicians Extract Your Money, Buy Votes, and Line Their Own Pockets, revealed embarrassing and outlandish instances of cronyism and self-enrichment by members of Congress. Despite the fact that funds from leadership PACs are supposed to go to help elect fellow members of one’s own political party, lax campaign laws allow lawmakers to turn their leadership PACs into private slush funds to fund just about anything. Rep. Rob Andrews (D-NJ), for example, tapped his wife, a lawyer and an associate law dean at Rutgers School of Law-Camden, to be a PAC compliance officer for his leadership PAC. She approved the use of donor dollars to fly her, Rep. Andrews, and their two daughters to Edinburgh, Scotland for a wedding at a posh resort. Andrews’s leadership PAC paid $16,575 in airfare. His campaign committee picked up the rest of the tab, which was slightly under $14,000. Schweizer says Andrews’s leadership PAC even paid for the wedding gift, which was china from Bloomingdale’s. Andrews and his wife even merged a campaign event with their daughter’s graduation party, allowing them to combine the costs of the two events, even though the PAC did not pick up the entire bill. When Kroft confronted the Democratic New Jersey congressman, Andrews said, “I think we should take a look at having clearer rules at what they can and cannot be spent for. I’d be for that.” Andrews claimed he could not speak more on the matter because of a pending House Ethics investigation, even though Kroft said the committee told him they were fine with Andrews speaking about the matter. Rep. Gregory Meeks (D-NY) attempted to use $6,230 in campaign funds to pay for a personal trainer. Meeks’s staff claimed using campaign money for a fitness instructor is a legitimate expense, because gym visits alleviate stress from Meeks’s “official duties.” The investigation also revealed that Meeks has used $35,000 from his leadership PAC on NFL games. The 60 Minutes special also revealed how members of Congress exploit a self-loan loophole that allows politicians to loan their own campaigns money at high interest rates and then let the loans linger to generate hundreds of thousands of dollars in passive streams of profit for themselves. Rep. Grace Napolitano (D-CA) has bagged at least $294,245 since 1998 by loaning her congressional campaign money at interest rates up to 18%—a scheme that effectively funneled campaign contributor donations into her personal bank account. After numerous attempts to interview Napolitano, Kroft finally confronted her outside a Hispanic Caucus meeting. “She told us that as a woman and a minority, banks wouldn’t lend her money, so she had to withdraw $150,000 from an investment account to lend it to her campaign,” said Kroft. Kroft then questioned why she would charge 18% interest. “That’s what the Mafia gets,” he exclaimed. The 60 Minutes report also revealed that members of Congress are permitted to use leadership PAC money to hire their own family members. As Kroft and Schweizer point out, most corporations have nepotism laws that prevent the hiring of family members. And while congressional rules bar family members from serving on a congressman’s official staff, lawmakers are free to hire family to serve on their campaigns. Former Rep. Ron Paul (R-TX) put his daughter, grandson, daughter’s mother-in-law, grandson-in-law, granddaughter, and another relative—six family members in total—on his campaign payroll. The Paul progeny received a combined $304,599. Kroft also confronted retiring Rep. Rodney Alexander (R-LA) about actions Schweizer reports on in Extortion. Alexander paid his two daughters over $130,000 in combined expenses for working on his campaign, which he won with an overwhelming 78% of the vote. Kroft asked Alexander what his daughters did. I’m sure there are millions of americans who wish they had the “funds to get a slush”.